The following is an excerpt from 500 Treasured Country Recipes by Martha Storey & Friends. When St. Patrick's Day comes, we're all a little Irish. This delicious fruit-studded bread is good on the 364 other days of the year, too. And it is one of the easiest breads you'll ever make — no blarney! 1. Preheat oven to 375°F. Butter a baking sheet or cake pan. 2. 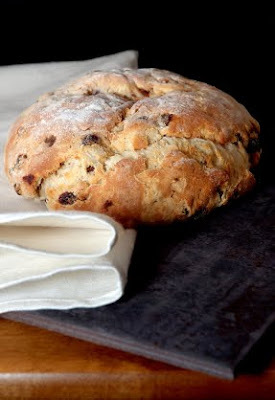 In a large bowl mix together the flour, salt, baking powder, and soda, then stir in the raisins, if desired. Add enough buttermilk to make a soft, kneadable dough. 3. Turn out the dough onto a floured surface, and knead it briefly. Shape into a round loaf, and place it on a baking sheet. Cut a cross in the top of the loaf with a single-edged razor blade or a very sharp floured knife. 4. Bake for 35 to 40 minutes. Remove from oven and cool on a rack. I tried this recipe yesterday, and it was pronounced "quite tasty" by my family (dh & two boys, ages 6 & 16). Took the rest to church this morning, where it was, again, pronounced, "very tasty". I did throw in some cinnamon, but otherwise followed the recipe.